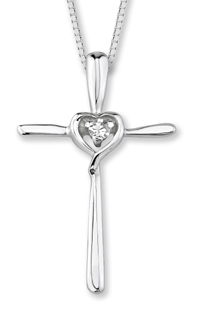 Beautiful and elegant 14k white gold diamond heart cross pendant. One diamond in the center, weighing 0.03 carats, symbolizes God's love. Diamond color: H-I Color, Clarity: SI1-SI2. Measures 14mm wide (9/16") x 22mm tall (7/8"), inclusive of bail. 14K White Gold 18" box chain included. We guarantee our 14K White Gold Diamond Heart Cross Pendant to be high quality, authentic jewelry, as described above.